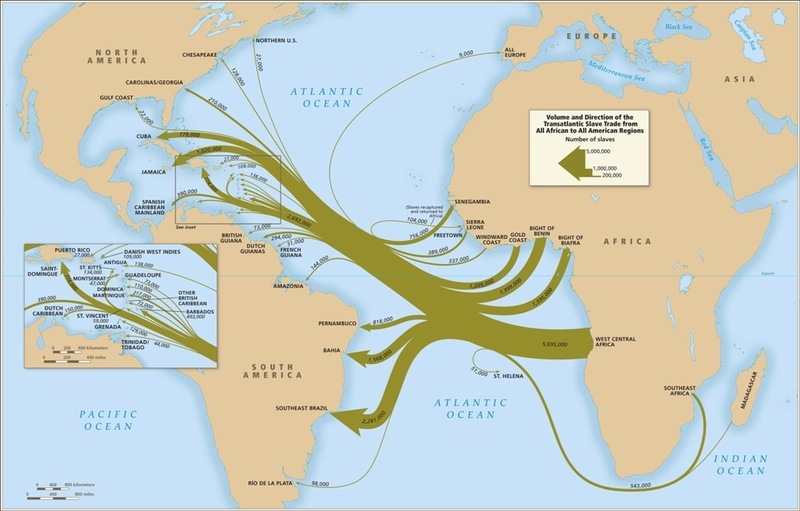 Map of volume and direction of the trans-Atlantic slave trade, Voyages: The Trans-Atlantic Slave Trade Database, courtesy of David Eltis and David Richardson, Atlas of the Transatlantic Slave Trade. The trans-Atlantic slave trade was the largest long-distance forced movement of people in recorded history. From the sixteenth to the late nineteenth centuries, over twelve million (some estimates run as high as fifteen million) African men, women, and children were enslaved, transported to the Americas, and bought and sold primarily by European and Euro-American slaveholders as chattel property used for their labor and skills. The trans-Atlantic slave trade occurred within a broader system of trade between West and Central Africa, Western Europe, and North and South America. In African ports, European traders exchanged metals, cloth, beads, guns, and ammunition for captive Africans brought to the coast from the African interior, primarily by African traders. Many captives died just during the long overland journeys from the interior to the coast. European traders then held the enslaved Africans who survived in fortified slave castles such as Elmina in the central region (now Ghana), Goree Island (now in present day Senegal), and Bunce Island (now in present day Sierra Leone), before forcing them into ships for the Middle Passage across the Atlantic Ocean. 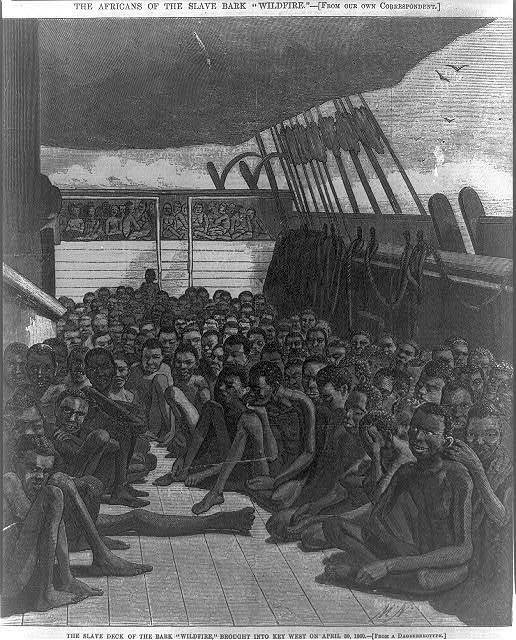 The slave deck of the "Wildfire" ship brought into Key West on April 30, 1860, illustration, Harper's Weekly, June 2, 1860, courtesy of the Library of Congress. Scholars estimate that from ten to nineteen percent of the millions of Africans forced into the Middle Passage across the Atlantic died due to rough conditions on slave ships. Those who arrived at various ports in the Americas were then sold in public auctions or smaller trading venues to plantation owners, merchants, small farmers, prosperous tradesmen, and other slave traders. These traders could then transport slaves many miles further to sell on other Caribbean islands or into the North or South American interior. Predominantly European slaveholders purchased enslaved Africans to provide labor that included domestic service and artisanal trades. The majority, however, provided agricultural labor and skills to produce plantation cash crops for national and international markets. Slaveholders used profits from these exports to expand their landholdings and purchase more enslaved Africans, perpetuating the trans-Atlantic slave trade cycle for centuries, until various European countries and new American nations officially ceased their participation in the trade in the nineteenth century (though illegal trans-Atlantic slave trading continued even after national and colonial governments issued legal bans). 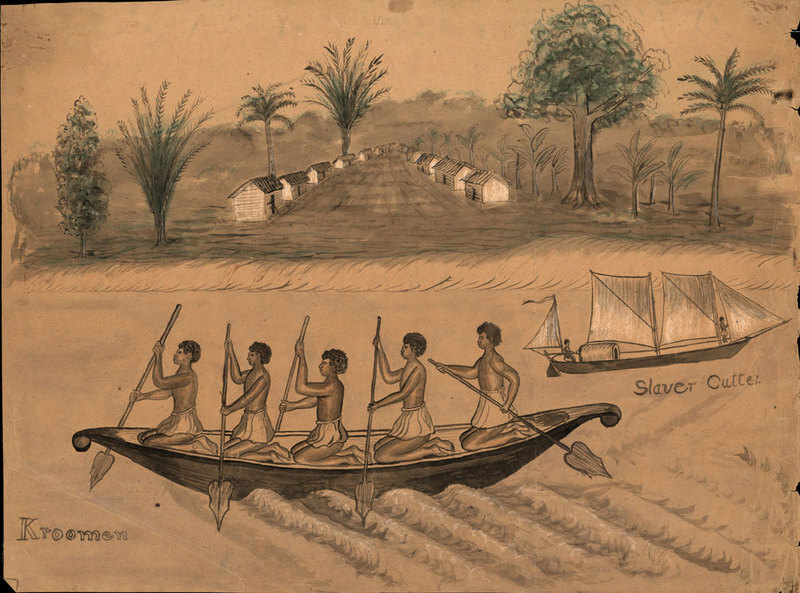 Large Canoe and Village Scene, possibly Liberia, mid-19th century, courtesy of University of Virginia Special Collections Library. Example of shallow water vessels used in West and Central Africa to counter European attacks and thwart early attempts at mainland colonization. In the fifteenth century, Portugal became the first European nation to take significant part in African slave trading. The Portuguese primarily acquired slaves for labor on Atlantic African island plantations, and later for plantations in Brazil and the Caribbean, though they also sent a small number to Europe. Initially, Portuguese explorers attempted to acquire African labor through direct raids along the coast, but they found that these attacks were costly and often ineffective against West and Central African military strategies. For example, in 1444, Portuguese marauders arrived in Senegal ready to assault and capture Africans using armor, swords, and deep-sea vessels. But the Portuguese discovered that the Senegalese out-maneuvered their ships using light, shallow water vessels better suited to the estuaries of the Senegalese coast. In addition, the Senegalese fought with poison arrows that slipped through their armor and decimated the Portuguese soldiers. 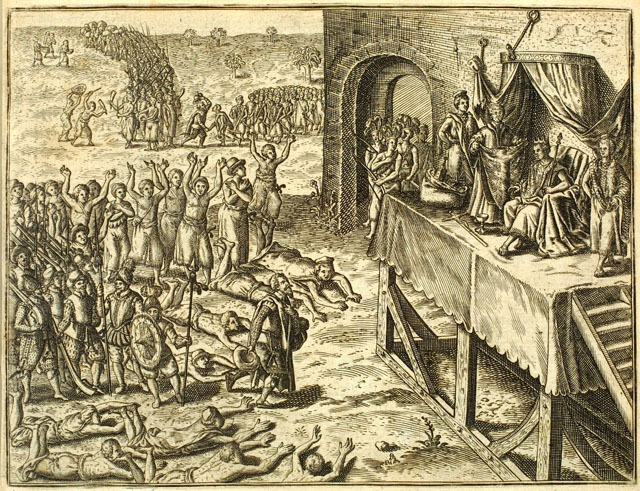 Subsequently, Portuguese traders generally abandoned direct combat and established commercial relations with West and Central African leaders, who agreed to sell slaves taken from various African wars or domestic trading, as well as gold and other commodities, in exchange for European and North African goods. Over time, the Portuguese developed additional slave trade partnerships with African leaders along the West and Central African coast and claimed a monopoly over these relationships, which initially limited access to the trade for other western European competitors. Despite Portuguese claims, African leaders enforced their own local laws and customs in negotiating trade relations. Many welcomed additional trade with Europeans from other nations. Manikongo (leaders of Kongo) receiving the Portugeuse, ca. pre-1840. The Portuguese developed a trading relationship with the Kingdom of Kongo, which existed from the fourteenth to the nineteenth centuries in what is now Angola and the Democratic Republic of Congo. Civil War within Kongo during the trans-Atlantic slave trade would lead to many of its subjects becoming captives traded to the Portugeuse. When Portuguese, and later their European competitors, found that peaceful commercial relations alone did not generate enough enslaved Africans to fill the growing demands of the trans-Atlantic slave trade, they formed military alliances with certain African groups against their enemies. This encouraged more extensive warfare to produce captives for trading. While European-backed Africans had their own political or economic reasons for fighting with other African enemies, the end result for Europeans traders in these military alliances was greater access to enslaved war captives. To a lesser extent, Europeans also pursued African colonization to secure access to slaves and other goods. For example, the Portuguese colonized portions of Angola in 1571 with the help of military alliances from Kongo, but were pushed out in 1591 by their former allies. Throughout this early period, African leaders and European competitors ultimately prevented these attempts at African colonization from becoming as extensive as in the Americas. The Portuguese dominated the early trans-Atlantic slave trade on the African coast in the sixteenth century. As a result, other European nations first gained access to enslaved Africans through privateering during wars with the Portuguese,rather than through direct trade. When English, Dutch, or French privateers captured Portuguese ships during Atlantic maritime conflicts, they often found enslaved Africans on these ships, as well as Atlantic trade goods, and they sent these captives to work in their own colonies. In this way, privateering generated a market interest in the trans-Atlantic slave trade across European colonies in the Americas. After Portugal temporarily united with Spain in 1580, the Spanish broke up the Portuguese slave trade monopoly by offering direct slave trading contracts to other European merchants. Known as the asiento system, the Dutch took advantage of these contracts to compete with the Portuguese and Spanish for direct access to African slave trading, and the British and French eventually followed. By the eighteenth century, when the trans-Atlantic slave trade reached its trafficking peak, the British (followed by the French and Portuguese) had become the largest carriers of enslaved Africans across the Atlantic. The overwhelming majority of enslaved Africans went to plantations in Brazil and the Caribbean, and a smaller percentage went to North America and other parts of South and Central America. Elimina Castle, or St. George Castle, Gold Coast (present day Ghana), from the Atlas Blaeu van der Hem, 1665-1668. The Portuguese established Elmina on the Gold Coast as a trading settlement in 1482. It eventually became a major slave trading post in the trans-Atlantic slave trade. 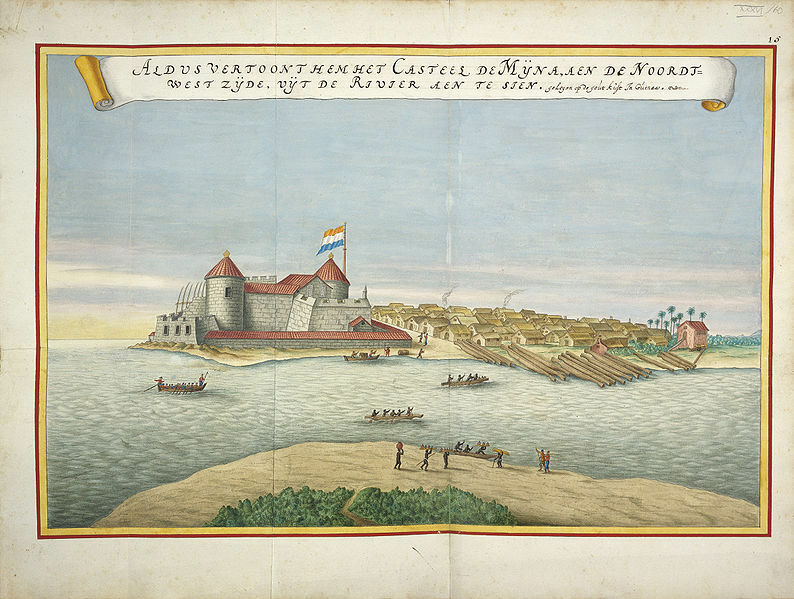 The Dutch seized the fortress from the Portugeuse in 1637.